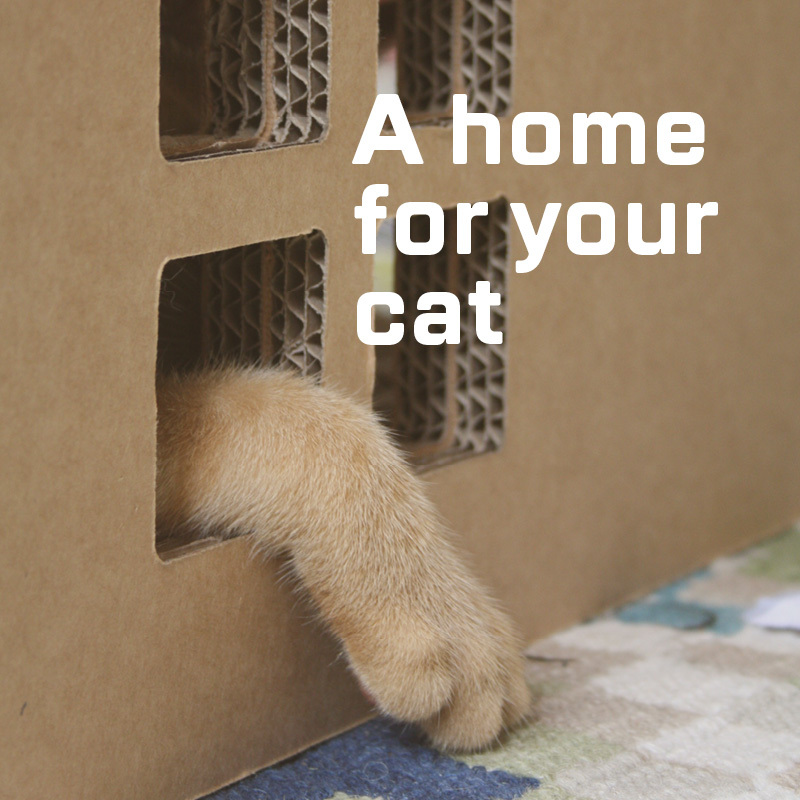 We are very pleased to feature this beautiful cardboard scratch house designed especially for your feline friend. The word Krabhuis is Dutch for “scratch house” and as you might have already guessed it was designed by three architects from Rotterdam. We found this product particularly exciting as it was intended to bring together a cat’s two great loves, cardboard boxes and the inherent need to sharpen their claws through scratching. The design of this cardboard creation means it wouldn’t look out of place in even the most modern home. The design-conscious creators searched in vain for a suitable scratch post to match their stylish interior. They also knew (like all cat owners do) that their cats would prefer the cardboard box the item came in anyway. 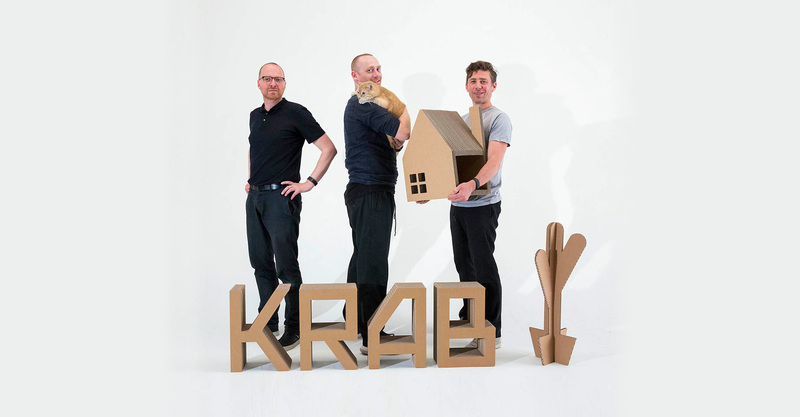 They cleverly combined their architectural skills with their cats love for cardboard boxes, and Krabhuis was born. Natural cardboard finish, just the way your cat likes it! Krabhuis is produced entirely in The Netherlands and transport is minimalised: from Parcours, the Krabhouses directly find their way to cats worldwide. When your cat is done with the house, it can be recycled, maybe even into a new Krabhuis! Krabhuis is assembled by students of Parcours, a school for secondary special education, as part of their Arts & Crafts project. Krabhuis is a product from Drievrienden. This company was established in March 2013 by three architects from Rotterdam, The Netherlands. Drievrienden aims to design interior-objects with an architectural twist. Drievrienden produces products in an environmentally friendly way. Krabhuis is their first object. Krabhuis the movie was released in collaboration with dailymilk, a Dutch design studio from Rotterdam, the studio which is also responsible for the entire visual identity and website of Krabhuis. The designers are very much aware that cats are notorious interior wreckers – no curtain is safe, and no sofa will be left unscratched. The interiors in Krabhuis the movie suffer the same fate: the five restless cats destroy all three rooms! With Krabhuis the cat-stars eventually find their own peaceful place – and home. Krabhuis the movie was produced and released by dailymilk. View the full movie here! Krabhuis the movie – trailer from dailymilk on Vimeo. You can buy your Krabhouse directly from Krabhuis. Outside Europe €105, excluding taxes, local tax fee may apply. It takes three weeks to assemble, package and ship your Krabhuis. It is shipped fully assembled: all you have to do is unpack, place it on the floor and let your cat move in! All images remain the property of Krabhuis and were obtained from their Krabhuis communication kit which was kindly provided.